Our approach to writing a best man speech is to make it personal. There are plenty of places online to find generic speeches with canned jokes, but…seriously? It’s that time of year again. No, I am not talking about spring. I am talking about best man speech writing season, which always comes just before wedding season. Best man speeches are among my favorite writing projects, so if you know anyone who might soon be giving a best man speech, please send them my way. But be forewarned – I will ask questions! Why will I ask questions? Because I don’t believe a canned speech with canned one-liners makes for a very good best man speech, and I hope you agree. 1. How do you know the groom? This is the first and most important question. The groom chose you because he knows you, he loves you, he trusts you. You have shared experiences that go all the way back to…when? What event? What time? I need to know this, because the entire premise of your speech is based on your relationship with the groom. 2. How well do you know the groom’s family? Since the groom’s family will all be participating, and a wedding is to a great degree a family affair, we really should try to integrate the family into the speech. Unless you really don’t want that, of course. So whatever you can tell me about your relationship with his family, the better. 3. How well do you know the bride? Her family? Since the whole point of a wedding is to bring together the groom and the bride, we ideally want to work the bride, and perhaps her family, into the speech. More than just a passing mention is ideal, especially if you have known her for a while. Bearing witness to the humorous and impressive things that the bride and groom have already done together makes for great content in a best man speech. 4. Are there other people you really should mention in the speech? Sometimes there are specific people who would be deeply offended to be left out, such as perhaps somebody who was instrumental in bringing the couple together, another man who was a third amigo with you and the groom, or a rich uncle who is always trying to decide who gets the private island in the Mediterranean. So this is both about who you want to include and who you don’t want slighted by omitting them. 5. What personal anecdotes that you really want to mention? Sit back and reminisce. Feel free to go free-form here and include as many details as you wish. It’s the anecdotes that people often enjoy the most – little insights into the groom and his exploits, the funny side, the touching side, the impressive side. We often get the best material for the meat of the speech in response to this question, so take your time. A best man speech is about emotions and humor, and the anecdotes hold it together. 6. How is the groom’s life about to change? Sometimes being married changes things and sometimes it doesn’t. But sometimes there is more than just the marriage happening. If a baby is on the way, or the couple plans to move to another town, you will probably want to refer to it. The best man speech is an ode to the past, but also a toast to the future of the happy couple together. 7. Are there any cultural or family sensitivities you should avoid? Cultural issues don’t factor into most weddings, but they do in some. Typically they appear if a family is deeply religious – or one of the families is deeply religious – or when it is a cross-cultural marriage. Similar issues might be on the horizon if you wish to mention the black sheep of the family, or if somebody is particularly sensitive about something. 8. What personal advice do you wish to share with the couple? For whatever reason,weddings seem to give people license to throw around advice like a frog in a blender. Don’t miss out on the action. Perhaps there is a lesson from your own marriage or some other inspiration to share with the couple. 9. What is your comfort level with humor? What style of humor? Best man speeches usually have a lighter side to them, so it helps for the writer to understand whether the best man is more comfortable with self-depreciating, dry or some other kind of humor. 10. Anything else I should know? Here is the big catch-all, since we have no way of knowing what else there might be that should be included. But the best man knows, so here is his chance to spill the beans. So there you have it. Ten questions our ghostwriter asks of the best man before writing his speech. You can always string together some canned one liners, but much better to write a custom best man speech, just right for the best man, just right for the happy couple, just right for the occasion. You can do it yourself, or we can help. But, these are fantastic questions to employ. Roy, if Donald Trump will pay for the wedding, he would make the ideal best man. “It’s the anecdotes that people often enjoy the most ” — applies to ANY communication! “If a baby is on the way, ” — what kind of weddings do you attend — LOL. Here , those are called “Shotgun Weddings”. “license to throw around advice like a frog in a blender. ” — Classic line. I’ll steal it and re-quote OFTEN! The author has WON, Big Time! Thanks, Jim. I don’t think there can be a bigger compliment than being quoted. If possible, make your speech a blend of sincerity and humor. 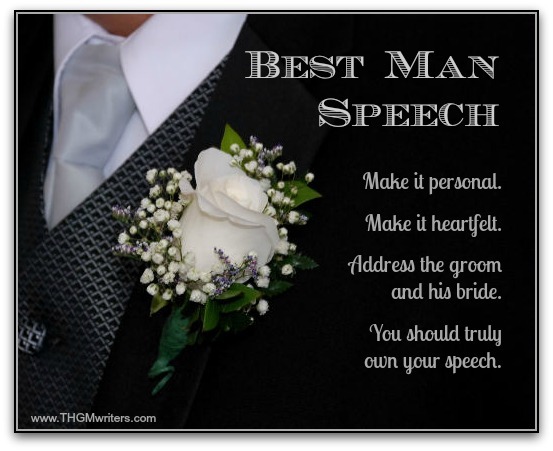 Tasteful humor tends to go over well in most speeches, and a best man’s toast is no exception. A good joke is especially valuable as an icebreaker at the beginning of your speech, and some comic relief is always welcome after a sappy, heartwarming story.